A consultant should be able to easily determine which documents have already been sent to a supplier for an order. 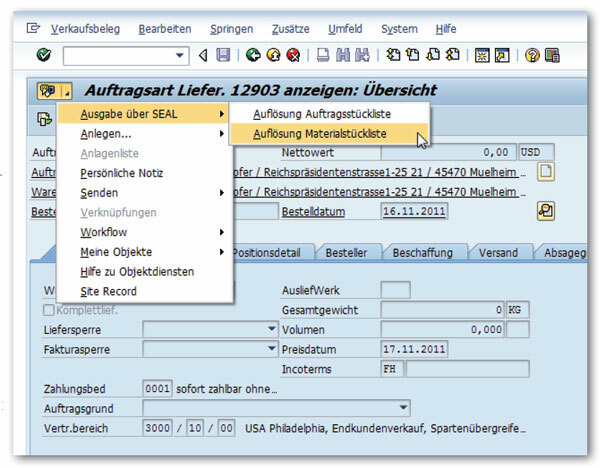 You can jump directly to the relevant output jobs through object services in the SAP order transactions (me2xn). The function determines all output jobs, which have previously been generated by this order and simultaneously checks if new versions of the documents are available, which have not been previously issued. If so, then this information is displayed in a pop-up. Subsequently the list of relevant output jobs will be displayed and the newest order will be opened. This is especially helpful in long standing orders where there have been alterations of construction. You would like to identify documents without a customer’s bill of materials. You can jump directly to the SEAL Systems itemized bill of materials through “object services” in the SAP customer sales order transaction. Thereby all the materials from the customer order are transferred to the bill of materials. The further structural resolution takes places through the standard function of the known good practices from SEAL Systems for document investigation. You can download our fact sheet regarding object services here. In his capacity as Account Manager, Jürgen Gotthardt is out and aboutconsulting on - and marketing - solutions for SAP.His main focus are the illustration and optimization of document based SAP business processes. In his personal life, his great passion is football.